Before the holiday season who really needs all you can eat? I don't know about you, but with a month of copious consumption ahead, I know my limits. 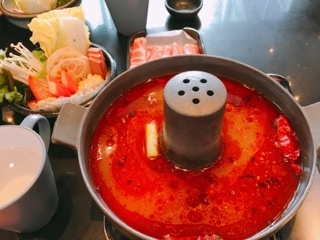 So many hot pot restaurants drives consumers towards over eating with the promise of bringing dish after dish of whatever you want (within a two hour limit). Sure, sometimes you want to stuff your face, but on other occasions, it’s nice to just enjoy a meal without worrying about getting your money’s worth. 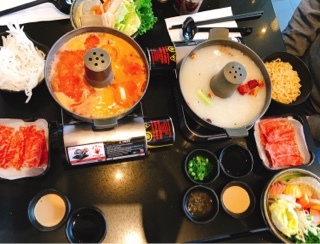 Spicy Mafia is a new hot pot establishment. 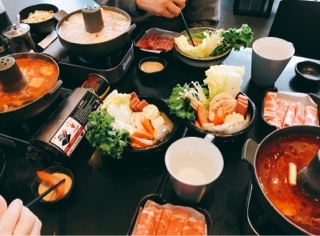 From the owners of Morals Villages, an aforementioned AYCE, their limited portions will allow you to enjoy the bubbling pot without spending too much time or calories. It’s a simple concept, you choose from a standard list of items. First, the all-important soup base: most are $12.99 with the exception of the ultra-hot exclusive spicy version that’s a $1 more. Having tried the milder signature “ma lat” spicy soup, it already had me downing water and soon left the tongue numb. Perhaps I’m a light weight as the waiter noted they've had to tone it down for the "north American" palette. Personally, I prefer the house made pork bone, which consists of a strong bone broth essence and goes nicely with the noodles after being infused with the other ingredients. They also have a tomato version of the pork bone, for those who want an extra vitamin boost. Two dipping sauces from a choice of eight items. 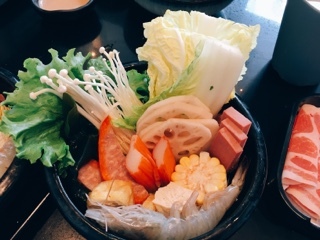 Afterwards, every person gets a standard bowl of fixings: spam, imitation crab, Hong Kong style red sausage, a shrimp, tofu puff, napa cabbage, lettuce, lotus root, a small cob of corn, seaweed and enoki mushrooms. Overall, the meat is rather skimpy with a mere five slices, while the other proteins (spam and red sausage) fine but not the typical ones I’d choose (where are the fish balls)? If you only order the standard package, you’ll likely leave hungry. However, there’s the option to add on additional items – most $1.50 a serving with the exception of meats that are $2.50. In the end, even if you need a few more, the meal shouldn’t be too expensive (compared to $30 price tag Morals will set you back). Plus, you won’t feel guilty about over indulging. After all, sometimes you just need to show restraint and not leave in a food coma.